Storage solutions are some of the most practical promotional products available. We all have many things to store, both at home and at work, with the cases and jars from allbranded, your clients will keep their products safe whilst at the same time promoting your corporation. All of the storage items featured here can have your corporate logo applied to the front to help enhance your advertising effect. These make excellent stand alone items, but can also be paired with other promotional products to make a gift bag, these could include pens, notepads and promotional notebooks, all branded with artwork of your choosing. We stock hard case card holders – an excellent gift for business partners, wooden chests as a more premium present, piggy banks and foldable bottle holders just to name a few. These can also be branded, and will be greatly used and appreciated by all recipients. Storage is an important part of day to day life, it helps us to keep tidy and organised. This is important aspect not just at work, but also at home. By giving printed storage solutions, your customers will associate your business with order and organisation. They will be thankful for these promotional items and are sure to use them daily. With daily use your clients and the surrounding public will be influenced by your branding on a regular basis. The jar sets in this category can be used for many things, from sugar and coffee to little stationary items, the versatility of these products is huge. The wooden chests feature carry handles and leather strap detailing, these can be used as premium hand-outs for business partners, who will be sure to remember your business fondly after receiving such a high quality, promotional gift. The small piggy banks in this collection also make fun and unique giveaways, these will appeal to everyone, but would particularly suit a younger demographic. The promotional cord organiser would be a greatly used item as many of us have so much machinery at home and work, that a mess of cables is almost inevitable. Whichever storage solution you choose; they can be personalised by having your corporate design applied to the front. 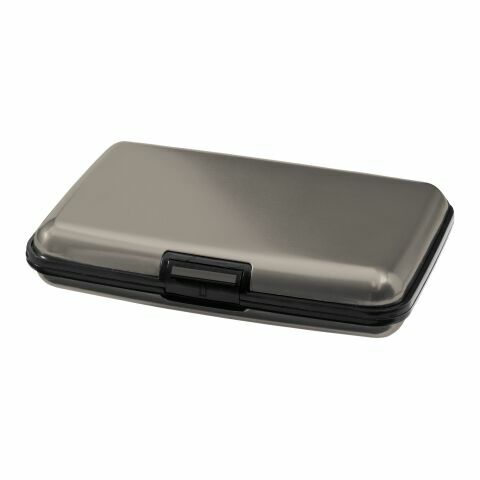 These items are more unusual than the a href="https://www.allbranded.co.uk/Office/Storage-And-Organisation/Bread-Lunchboxes/">printed lunch boxes or branded pen, which will help your business to be remembered. The cardholder would be a welcome present for anyone who have a profession of their own, so they can easily carry their business cards around with them. When they take out their cards to give to someone, the client will see your branding, thus spreading awareness. The branded piggy banks look fun and colourful when sitting on a desk, and will ensure the recipient will be faced with your company design all day at work. Sports teams and gyms will benefit from the sports bottle trays, capable of holding and easily transporting up to 10 bottles. Storage is a useful and practical part of our working and home life. It makes it easy for us to keep our surroundings neat and tidy, whilst also giving a home to all the necessary tools and products we use. Without storage, we would be living and working in chaos! There are many opportunities to use promotional storage to your advantage, as premium gifts to your business partners, or as cheap giveaways to customers, everyone will appreciate these useful promotional items. Every time your customer interacts with this storage, they will be faced with your corporate design, which will help them to remember your company. We can help you create the perfect promotional storage products, that will help you become remembered and appreciated by your clientele. Once you have chosen your desired style, you can choose your preferred colour, and finally have your business logo branded on the front. If you have any questions about the design process or any other queries, please don’t hesitate o give our friendly team a call.